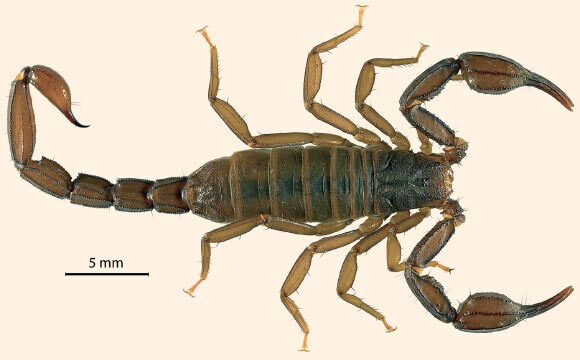 New Scorpion Species Discovered in Northern California near the confluence of North and Middle Forks of the American River in El Dorado County. A team of entomologists has described a new species of scorpion — Pseudouroctonus maidu — from the foothills of the Sierra Nevada in northeastern California.The newfound species belongs to the vaejovid scorpion genus Pseudouroctonus. It is known only from the type locality near the confluence of North and Middle Forks of the American River in El Dorado County. “California is home to a remarkable variety of scorpions. However, the more I study them, the more I realize that we’ve only just scratched the surface. A lot of scorpion diversity remains to be described,” Dr. Savary said. Adult Pseudouroctonus maidu measure between 30 and 40 mm in length. The base color is uniform dark reddish brown. The legs, chelicerae and underside of preabdomen are slightly paler. Dr. Bryson and Dr. Savary use DNA to help better understand scorpion diversity. “Scorpions have been around for a long time — over 400 million years — and many are quite similar in general appearance,” Dr. Bryson said. The scientists are working on publishing the descriptions of several other new species of scorpions from California. “2016 will be an exciting year for scorpion discoveries,” they promised. Research describing Pseudouroctonus maidu is published online in the journal ZooKeys.